We have a windy, gray day at the inlet. Skies are overcast and winds are blowing out of the East-Northeast at 25 mph, gusting to 31. The water is choppy and NOAA has a small craft advisory in effect through tomorrow morning at 4:00 a.m.
Over the weekend the bite was decent in spite of the wind according to Tommy Turowski at the Sebastian Inlet Bait and Tackle Shop. The Sheepshead bite was the most prevalent for anglers using shrimp or sand fleas. Snook were active as were Reds, Blues, Jacks and Spanish Mackerel. Shrimp are still running at night. Our angler of the day is Harry Jones of Columbia, SC. 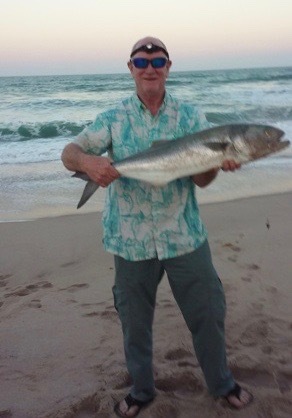 Harry landed this huge Bluefish using dead finger mullet from the beach. He also landed five other Blues, an undersized Red and five or six decent sized Whiting. All fish were released except for two of the Whiting which he took home for dinner. Sounds like a great day of surf fishing.